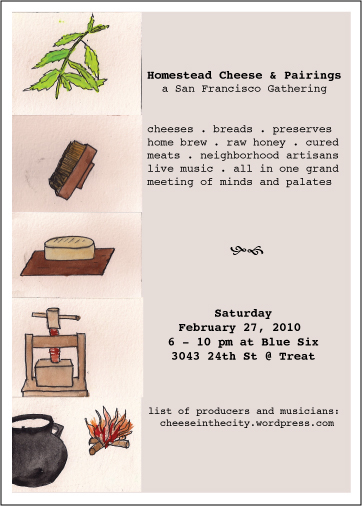 San Francisco’s First Homestead Cheese & Pairings Soiree! The craft of cheese making predates recorded history, tracing back to the domestication of animals in the Zagros mountains of Iran during 8000-6000 BC. Cheese craft took root in medieval European homes as a natural way to preserve milk. Today’s world of artisan cheese is rooted in the homestead lifestyle of the early Americas. A staple of many places at many times, cheese has remained a universal constant, providing the proteins and fats necessary for survival, fostering culture and community at the epicenter of life. Support local, up and coming cheese makers! Join us for an evening of live music and fine tasting, where pastoral lifestyle meets urban elegance! Enjoy cheese from our community paired with home brews, wines, and other locally made accoutrements! this list is growing! check back for the full menu! Slow Jams: quince jam and jelly, honey fuyu persimmon butter, and more! K.Ruby Blume, Sparky Beegirl Research & Ferment, Honey Wyne. I hope to see you there! This is the epic beginning of many more events to come. Be a producer! Feel free to contact me if you have any other questions about becoming a producer.